For parents, nothing can be more challenging than discovering that your child is a bully. Not only is it shocking, but it also can be an exhausting process especially if she feels she did nothing wrong. But with proper intervention and the right skill set, bullies can and do change. The key is to respond to your child’s bullying behavior quickly and efficiently. 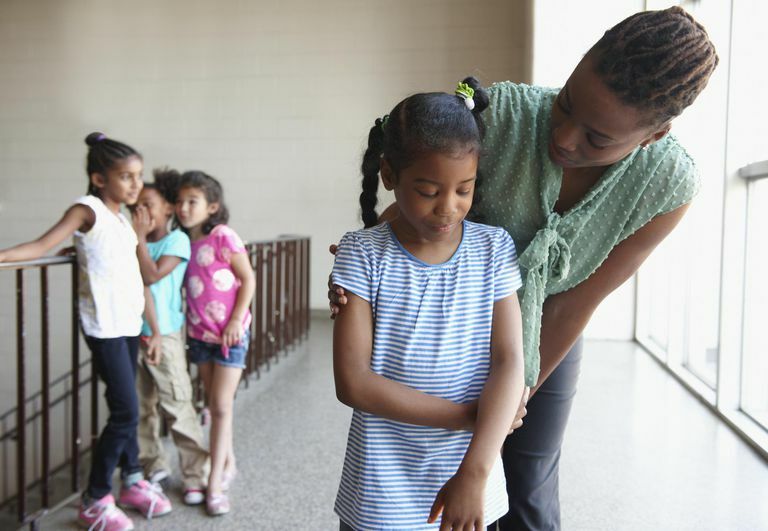 This early intervention involves not only disciplining the bully for her poor choices but also equipping her with the ability to take ownership. Here are seven ways to get your child to take responsibility for her actions and put an end to bullying behavior. When parents discover their child is a bully or that their child is a cyberbully, they often want to make excuses or provide explanations for the behavior. But blaming others doesn’t help your child learn important behaviors like self-control and anger management. Blame also prevents you from seeing your child objectively. Remember, your child will have to function in an adult world someday. It is better that she learn how to behave in a socially-acceptable manner now rather than later. As hard as it may be, you have to accept that your child has been bullying other people. Victim thinking allows your child to believe her actions were in some way justified because she was victimized in some way. It also falsely communicates that she is not responsible for her choices. Allowing victim thinking prevents kids from growing and changing. It also creates a sense of helplessness. And kids who are allowed to see themselves as victims have a very difficult time living a healthy and productive life. Even if your child has suffered at the hands of another, bullying is not an appropriate response. Resist the urge to excuse poor choices because your child was victimized. Instead, encourage her to make healthy, courageous choices in light of her experiences. Bullying is not caused by something the victim said or did. And bullies need to learn to take ownership of these choices. They also need to be able to recognize that what they did was wrong and how it made the victim feel. Stress that no one “made” them do it. Even in situations involving peer pressure, group bullying or bully-victim cycles, the bully is responsible for her choices. While there are many different ways to get a bully to take ownership, the key is that she can verbalize what she did wrong and sincerely take responsibility for her actions. If you want to get to the bottom of your child’s choices to bully others, you have to remain calm when expressing your dissatisfaction with her poor choices. What’s more, being calm makes it easier and more likely that she will admit to her mistakes and have an honest conversation with you. Also, stress that you still love her unconditionally, but that you are disappointed in her choices. This makes for an easier discussion of the impending consequences, making amends and doing things differently next time if she knows she is loved in spite of her mistakes. When determining how to discipline your child for bullying, it is important to be sure the consequences are in line with the severity of the offense. For instance, if your child was caught cyberbullying another person, the best course of action might be taking away her access to social media for a set period of time. Additionally, you should support any disciplinary actions the school has handed down. One way to get your child to take ownership of her choices to bully is to communicate how those choices impacted the victims of bullying. Doing so will help your child develop empathy and see that these bad choices hurt other people. While most people assume that apologizing is the best way to make amends, this is not always the case. Sometimes a victim is so traumatized by the bullying that any interaction with the offender will be counterproductive. If you do want your child to apologize, a nicely written letter might be helpful. You also could encourage your child to volunteer her time to an anti-bullying organization. Other options include requiring her to raise funds to help with bullying awareness, doing research on bullying and its effects or serving as a mentor for younger children. Sometimes bullying occurs when parents are too permissive or lack established rules. Give your child a set of guidelines regarding everything from schoolwork and outside activities to respect, digital etiquette and time spent online. Also be sure she knows what will happen if she doesn’t follow the rules. For example, if she cyberbullies other kids, she will lose his technology privileges. Or, if she engages in sibling bullying, she will be grounded. Then, be sure to follow through if a rule is broken. In the long run, your consistency will cause a change in your child’s behavior. If you discover that your child has been bullying others, do not let the shock and disappointment you feel dictate your response. Instead, focus on remaining calm and using the situation to teach your child not only how to make better choices, but also how to treat people with kindness. Remember, kids are still learning and growing. Look at this situation as an opportunity to help your child grow and change.